Chin Well Holding Berhad is one of the world’s largest manufacturers and suppliers of high-quality carbon steel fasteners which consists of screw, nuts and bolts. Through production facilities in Malaysia and Vietnam, Chin Well manufactures and supplies fasteners that are primarily utilized in highway guard rails, power transmission towers, furniture and other applications. The group has another segment, namely Wire division, which primarily manufacture variety of precision wire products. The performance of the group had been like in roller coast ride throughout the past few years. 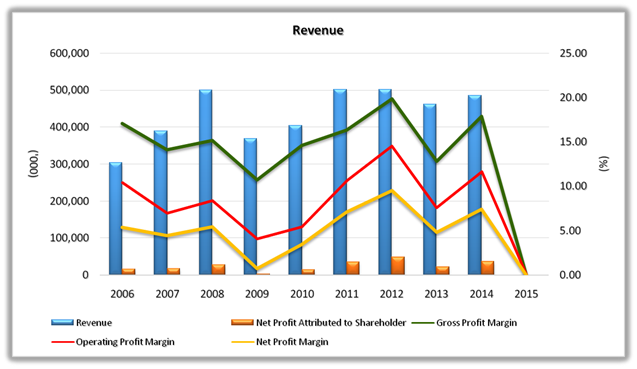 The net profit margin is thin and up down following the trend of gross margin. Low net profit in year 2009 was due to high inventory was written off that year. In 2009, the EU had imposed a five-year anti dumping duty up to 85% on imports of iron or steel fasteners originating in PRC, in an attempt to prevent further price distortions and restore fair competition. Unfortunately in late 2010, EU investigated allegations that PRC-made fasteners were being transhipped to Eu countries via Malaysia. In late July 2011, EU had announced that the group was one of the companies exempted from 85% anti-dumping duty that able to export carbon steel fasteners from Malaysia to EU. And the duty is still applies currently, waiting for extension. This duty helps the group to improve its sales a lot. In terms of balance sheet, it may not so look good at first glance as the total borrowings far exceed its cash balance on hands during the early years. But the trend is improving recently to achieve net cash position. 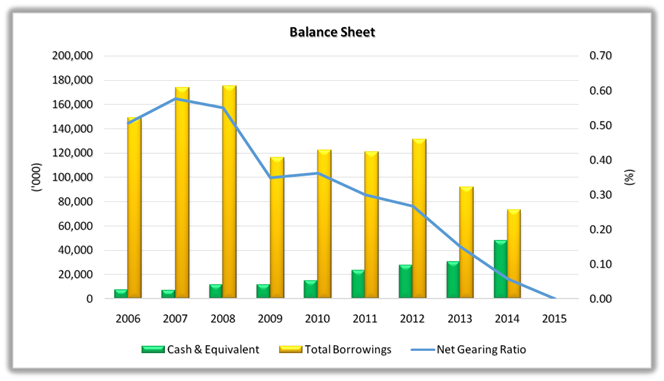 Net gearing ratio is at 0.06 at the latest financial year. It’s noted that all loans are denominated in USD dollar. So, the strengthening of USD may not doing them a favour, but the loan interest rate is quite low, less than 2% based on AR2014. 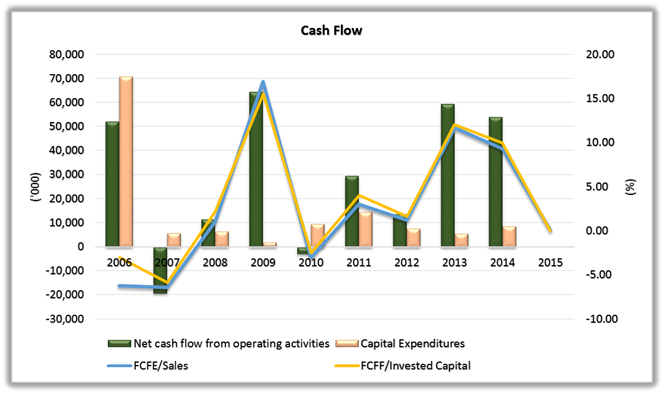 Net cash flow from operating activities may not be that smooth throughout the years due to fluctuating working capitals needed. However, the group managed to chalk up a good positive free cash flow in the last 4 years which explained why the group managed to pare down its borrowings while at the same time improving its cash position. If you are an investor who focus highly on fundamental, you’re probably kick this company out without any hesitation. ROE and ROIC are all below par, low and inconsistent some more. 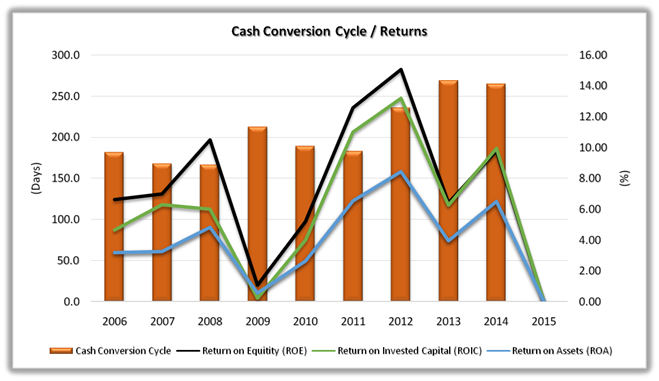 High inventory and trade receivables turnover contributed to its high cash conversion cycle. Cash conversion cycle for the past 6 years were more than 180 days. That’s 6 months, man. Its operating cash flow can be improved further if the group manage to bring down the numbers. Let’s take a look on its divisions. The performance of its Wire Products division is getting bad. Low margin and deteriorate performance. It just shows that how competitive it’s in the steel wire industry. Low entry barrier and involved in price war with its competitors. The group is still highly depends on its Fasteners division. Whether the group eat porridge, eat rice or eat wind also depends on it. The good point is the net profit growth rate is higher than revenue growth rate albeit the margin is fluctuating. In terms of market segment, ever since the anti-dumping duty being implemented by EU, export sales to European countries kept increasing. At the last financial year, European sales contributed around 58% of overall revenue. Majority of the Other Income comes from realized gain/loss on foreign exchange. At least 40% dividend payout policy. DIY customers considered as a niche market and able to fetch higher profit margin. Administrative expenses kept reducing each financial year. Fasteners are made of higher grade carbon steel wire rod, while Chin Herr’s raw material is from construction grade wire rod for basic foundation use. Based on AR2014, the group managed to secured contracts from the largest DIY fastener suppliers in Germany and France on top of US and UK in FY2014. The group invest in new high technology production lines to improve production efficiency, target to be commissioned in Malaysia and Vietnam plant by end 2014. In FY2013, the group form a JV with DKSH Holdings to form Swisstec Sourcing to source for DIY customers in both Asia and Europe. However on July 2014, the group disposed its 50% stake in Swisstec as Swisstec is loss making and to eliminate further future sharing of losses of Swisstec. Impaired around 2.2mils in FY2014. So in conclusion, Chin Well is just a mediocre company, at least didn’t not incur any losses. When checking its quarter-to-quarter trend, it’s nice to see that the performance of the group is in upward trend. So, can I say it’s having a turnaround? Special thanks to its Vietnam operation and better profit margin from its DIY product group as well as better sales to Europe. What prompt me to look into Chin Well is because of their recent corporate announcement. In Nov 2014, the group announced to acquire the remaining 40% stake in Chin Well Fasteners (Vietnam) not owned by the group for RM47mils. The acquisition will be fund via combination of issuance of 27mils new shares at RM1.45 to shareholders of Asia Angel and the balance via cash amounting to RM8.3mils. Chin Well Vietnam recorded net profit of RM21.4mils in FY2014. If Chin Well group own the remaining 40%, its net profit will be increased by RM8.56mils. That will give it additional EPS of 2.85 cents based on enlarge no. of shares of around 300mils. Full year EPS for FY14 will become around 14.78cents ((35.8mils + 8.56mils)/300mils). Of course, the current share price will be adjusted as well, depends on the timing of completion date. I view the acquisition positive as the labour cost in Vietnam is cheaper and the operation plant there focus more on DIY products which fetch high profit margin. The acquisition PE is around 5.5 (RM47mils / RM8.56mils) which is cheap and reasonable for me. So, the better performance recently, higher contribution from the DIY segment and the full equity stake of its Vietnam plant soon, perhaps it’s worth for you to take a look? 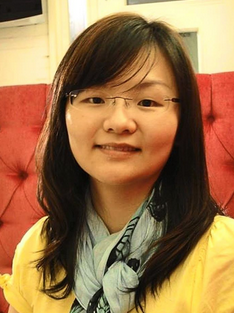 Oh ya nearly forgot, below lady, Ms Tsai Chia Ling is one of the executive director of the group. She is the daughter of the founder + managing director, Mr Tsai Yung Chuan. She is also a non-independent non-executive director of Tambun Indah Land Berhad. Her age is 35. Marital status: No idea. Nothing, really nothing. Just want to mention only. You do great analysis, much more in depth than what I do. Hope to see more. Hi, I have added your blog to my "Recommended Sites". btw, Mr Tsai can save you 20 years of efforts. LC, thanks for the adding. What do you mean by Mr Tsai can save me 20 years of efforts? wrong spelling, I meant Ms. Tsai if you still single.